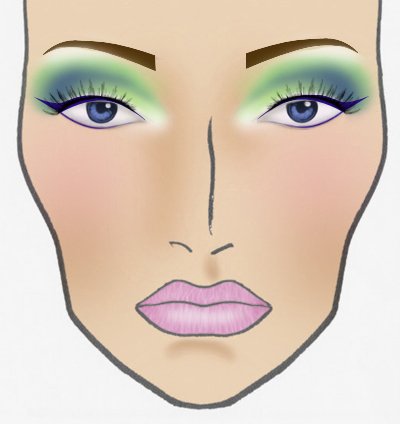 If you notice, in the face chart the eyeliner is blue. I tried using a blue liquid liner from Palladio which is a gorgeous color(Midnight - I used it in my Sailor Venus look), but it just would not be even or smooth. It was such a pain, I gave up and just applied black. So I would recommend NOT buying Palladio's liquid liners(not the pens but the ones that are like Revlon Colorstay). Test... anyway, I wanted to say that you have the prettiest eyes ever and I love all of your bold eyeshadow looks. Love your necklace too. Very pretty. Ah, the face chart always has a way of looking so much better than the look itself, doesn't it? I have the same problem. Either way I think this look is super cute. I wasn't able to comment on your previous post but I wanted to compliment you on the new layout. It's so adorable and the girl in the banner even looks like you. You can tell you put a lot of effort in and it shows. Makes me want to redo mine. Best of luck with your surgery. It's not always as bad as people say it is. They'll knock you out and you wont even remember a thing. Look forward to your return. Good luck with surgery and the look turned out great! So pretty!! I think it looks great! Good luck with your surgery! It's not that bad!